“Local To Global: A New Orleans Story,” an exhibition of works in various media organized by the nonprofit Artfully AWARE, opens Saturday with a reception starting at 6 p.m. at the Jazz & Heritage Gallery. 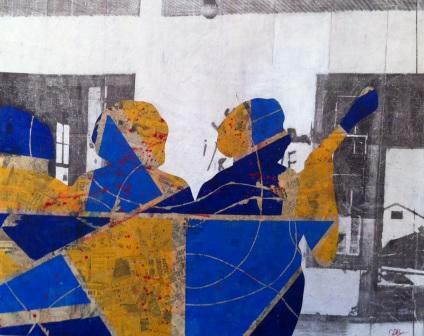 The Jazz & Heritage Gallery welcomes “Local To Global: A New Orleans Story,” an exhibition of works in various media presented by the nonprofit organization Artfully AWARE. The exhibit opens with a reception on Saturday, Aug. 13, from 6 p.m. to 9 p.m. The cellist Monica McIntyre will perform. The paintings, photography and poetry in the exhibit focus on New Orleans themes – some contemporary, some historical, all commenting on cultural rebuilding in the aftermath of Hurricane Katrina. Artists featured in the exhibit include: Jamar Pierre, Christine Dominique Bagneris, Martin Benson, Robert Johnson, Clara Diaz, Hilary Wallis and Dane Verret. The Jazz & Heritage Gallery, located at 1205 N. Rampart Street (at the corner of Gov. Nicholls Street) is at the gateway to the Treme neighborhood. Regular opening hours are Monday through Friday, from 10 a.m. to 4:30 p.m. Admission is free. The Jazz & Heritage Gallery is a program of the New Orleans Jazz & Heritage Foundation, the nonprofit that owns the New Orleans Jazz & Heritage Festival presented by Shell . The Foundation uses the proceeds from Jazz Fest, and other revenues, for year-round programs in the areas of education, economic development and cultural events. For more about the Foundation, please visit our web site. For more information, please call the Jazz & Heritage Foundation at (504) 558-6100.